Rabett Run: Eli Goes Goddard or Where Tamino Dare Not Tread. Tamino is playing mole whacker with Steve Goddard's latest, so in the tradition of Andrew Gelman's worst graph in the world contest (sort of a Bulwer-Lytton for Excel users) Eli came up with an entry and he even based it on the latest at Open Mind, altering a graph of disasters declared by FEMA, by adding a line for GISSTEMP, also suitably altered. "anomoly" instead of "anomaly" on y-axis. A whiner indeed! You take the prize. You make the elementary logical mistake that correlation implies causation Your hypothesis lacks a plausible physical mechanism to explain why increasing natural disasters lead to increased global temperatures. I counted the number of ups and the number of downs in that graph, and they come out equal, so the trend line is flat. There is no temperature increase or decrease. Disasters cause friction with all the rushing around and friction results in heat. Disasters also cause much Congressional hot air. So natural disasters cause heating directly and indirectly. Backed up by the data; case proven. The colours are pretty. It looks good to me. Which journal is going to publish it? Recall the situation after Katrina and to a lesser degree, Ike. FEMA had prepared truckloads of ice to deliver to those without power. However, no one in New Orleans needed ice as badly as they needed rescuing - and so the ice was trucked around the country for several weeks before finally being disposed of. That certainly caused considerable warming. Wow, kudos to you for keeping this blog going after so many years and so few readers. While you write-ups are a wee bit dull, you've certainly attracted a handful of yes-people. Bully !! I'd say the correlation is rather bad, see f.e. how on june 1979 there was 26,6 disasters and march 1981 had 14,8 dissters though the GISSTemp goes up. But maybe those are cold disasters before march 1981. Just eyeballing your wonderful graph, its obvious that disasters lag temperature by around 800 years. Wel yes-people, we can see how corruption kicked in. In the Little Ice Age, that is 1973, more disasters were declared as it was freezing colder. Of course. But look what happened when IPCC took over! Ref the question "The colours are pretty. It looks good to me. Which journal is going to publish it?" Roy, with all the troubles he's got getting published even in the most 'Remote [ly] Sensing" journals, is developing his own glossy: "Spencer's Newest World Order Physics". On the introductory page "I Am, therefor you're not, reading the tea leaves correctly". Off-topic but the bunnies might find this amusing/depressing. Keith Kloor has a plea for more nuance in the climate conversation at the Yale Forum on Climate Change and the Media. Hilarity in the comments ensues. Is he so blind that he can't see you can't reach an understanding with those whose sole purpose is to prevent reaching an understanding? Easily considered 'plausible physical mechanism' that can lead to increased warming as the result of natural disasters, destroyed infrastructures requires replacing, this increases industrial activity which in turn leads to more GHG release which - well you supply your own answer, not that difficult. As managers of the NDS, FEMA has a mandate to take prudent action to reduce demand , lest the National Disaster Stockpile suffer the fate of previous strategic commodity reserves, witness the complete depletion of the nation's once carefully husbanded stockpile of the chinese duck feathers after rising temperatures led to the degradation of the MIl Spec performance specification of our armed forces sleeping bags. By merging the management of the nation's columbium and niobium stockpiles, FEMA has freed valuable human resources to devote to increasing the FEMA disaster supply to keep pace with temperature releases from SUSIS ,the agency's Seldom Used Statistical Index Stockpile which is undergoing extensive redaction in order to reduce the work load at the American Tradition Institute, which accidentally requested a print-out of all Federal documents containing the temperature designating letters C, F, and K in a FOIA request filed earlier this year. Apparently I have more than the average number of legs. Before you can conclude that more severe weather leads to higher temperature, I would advise you compare us temperature with Fema us data. As your study now stands you're comparing watermellons with oranges. 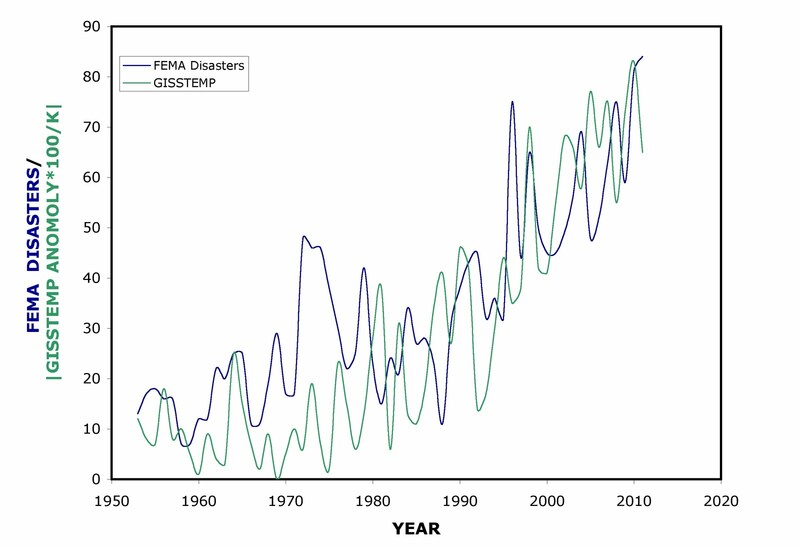 A more resonable study would be to look at us temperature agains Fema data. It would be nice to see if a more localized study would show that extreme weather events leads temperature or the other way around. As your study now stands it is fatally flawed.